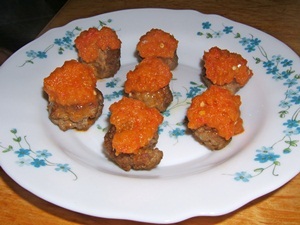 In the 70ies my mum used to cook Cevapcici with Ajvar. In the butcheries readily seasoned Cevapcici could be bought - lying next to Shaslik skewers. Ajvar was taking home from holidays. Classic Ajvar as you may know it from vacations in Slovenia is made with lots of red bell peppers, some aubergine, chili and garlic and you boil and stir slowly for a very long time. I did change this sauce and made a very quick vegetable sauce featuring red bell pepper which you can combine with meatballs, minced meat patties or frikadeller. 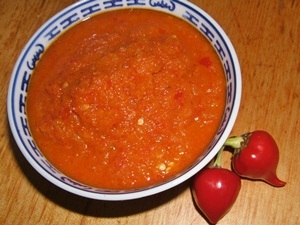 The quickly prepared bell pepper sauce is a great alternative to tomato sauces or ketchup. Bell Peppers-Onion-Chili Pepper-Sauce - reminds with its radiant orange colour of summer months. In the photo you can see our homegrown chili pepper this year, it is called Skopje. It is a rather small plant, not higher than a meter and over and over covered with red chili peppers. We usually eat the sauce freshly made and warm, put you can fill it up into glasses and store them in the fridge. You can serve the sauce with köttbullar, albondigas, rissole, frikadellen, kotleti, polpetti – everything prepared with ground meat or minced meat. You can of course eat them as well with fish or fried camembert. For this nostalgic food we use nostalgic dishes - this plate belonged to my grandmother and I used to eat from it when little. We think the orange pepper sauce on the white plate with blue print goes together very well. Wash vegetables, remove the seeds or peel, cut in big slices and put into blender. When all is blended stir into the pan you used for frying the meatballs (or us another pan with some oil). Let it roast a little, heat up, add water, salt, vinegar and let it simmer for 5-10min, add spices and serve. 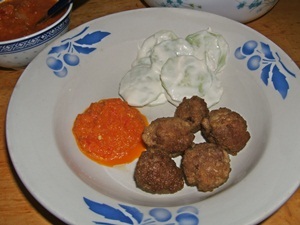 We usually serve meatballs with red bell pepper sauce and cucumber salad with sour cream. You can cook the sauce with more ingredients and produce some stock and adapt some ingredients. Just take care you don't use too much apple vinegar. Better you only use a little at first and add some more later. We do not use too much sugar, as the vegetables in this recipe are rather sweet, the apple vinegar adds a fruity sweet-sour touch, which gives the sauce a great relish-character. Our chili pepper this year – it is chili Skopje – is really hot and spicy when raw, cooked it looses all its strength. Therefore I put some of the seeds and the inner parts of the chili pepper apart and add it to the sauce when finished, this makes our sweet-sour bell pepper sauce chili hot. The only thing – you can't store it for very long in the fridge when raw ingredients are included. Typical for a family meal: everyone decides what goes on his or her plate and everyone arranges the food to his or her taste. Even the little meat lover gets a portion of vegetable masked as hip chili pepper sauce - shhh, don't tell. You can of course leave the chili peppers apart if you serve it to kids or people who don't like chili peppers. Gourmets can skin the bell pepper before blending – by either roasting the peppers or putting them into the oven at high temperature. Blending vegetables is a trick in our family to get children to eat at least every now and then vegetables they usually would not touch. We love self-made vegetable sauce. First we can eat something where we can control that there are no preservatives or artificial flavours and we usually don't add that much sugar industrially produced sauces have. Have fun preparing the sweet-hot bell pepper sauce recipe.